This 16 hour course will prepare you to get your Oregon CCB contractor's license. 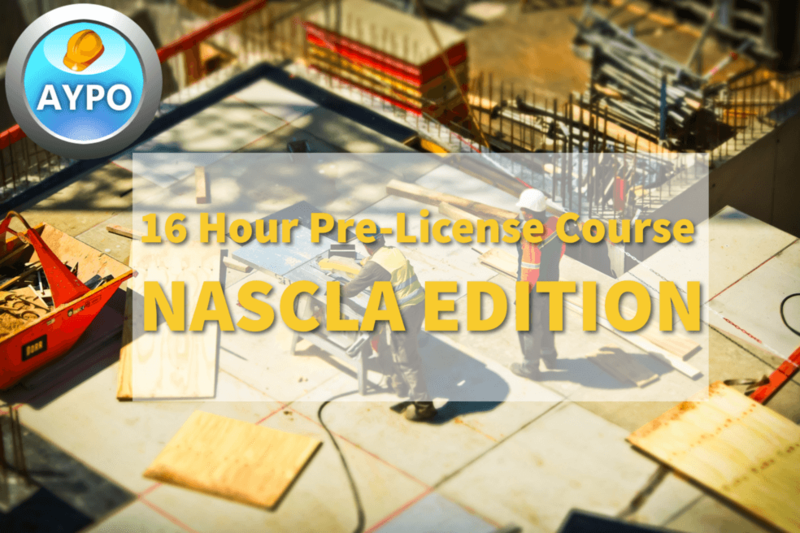 The course follows the NASCLA text book issued by the CCB. Your book will be shipped to you in 3-5 business days. The course is broken up into 10 chapters based on the 14 chapters of the NASCLA book. The contractor licensing structure in Oregon. How to setup a business and hire employees. How to create and enforce contracts with subcontracts, vendors, customers, and more. The methods for managing projects and jobsites. The laws that will govern your business such as the Oregon Building Codes, environmental quality laws, and the tax regulations. How to manage the finances of a construction business including accounting systems and payroll. An overview of the building exterior shell. The course is designed to progress at your pace. Each chapter has a review exam that will review the important topics of that chapter. You can review the chapters in any order and can go back to a chapter after completing it. 03. What is Project Management? This is very helpful thank u! Simple and straight forward education. Great course for people with busy schedules. Very tricky wording with the questions. Have to really pay attention, which is good. Patrick and Austin have been very knowledgeable and have helped this process move along effortlessly. Good generalized material. Good format for each section. Decent course overall, easy to follow instructions and you can finish the course at your own pace. Hard. But, to the point. I really liked the way you could come back to the course and work at my own pace. thanks! lots of information broken up and taught very well in a way it could be retained. This is a great course. Great customer service from start to finish. A special thanks to Elisa in teck support for her great customer service. Gave me a lot of confidence and has outlined all the important aspects of the law, and provisions. I thought the course review and the book worked well together. Very informational, and the quiz wasn't as easy as I thought it was going to be. Which was a good thing, I believe in the long run it helps with making sure people know their stuff before being licensed. Good course. You can study from your mobile device, which keeps you on track... 100% reading, which is okay - I like some videos to change it up a bit. I was excited to get started and almost completed the full course before I received the book, only real draw back is that I could not highlight thought the course or refer to some of the charts referenced during the course. Overall very satisfied... That is, if I PASS! haha! Guess that one is on me! I learned so much through this course. It was a lot of work but I am glad to have the knowledge to move forward for the test. Excellent Course and I really like that I can take the quizzes multiple times. The online course was very helpful and kept me on track. Found it very easy and convenient to manage chapters and quizzes into my already busy day. I love that you can do this on your own time and that you can take the tests as many times as you want. Very informational but when asking about Key personnel and continuing education "key" should be contained somewhere in the question. It was informative and well written. The interface was designed efficient. It gave abundance of links to accesses Related information to further your knowledge on the subject. GREAT PROGRAM, EASY TO FOLLOW WITH LOTS OF CURRENT INFO. 5 STARS !!! Thorough. The material was well organized. Some typos, but most questions made it easy to look back on what we learned or research with the book provided. the course provided great knowledge and was well written. FIVE STARS TO BE SURE . EXCELLENT . It would be nice to have an index in the back of the book. Great course and easy to follow. Not all contractors build houses. That being said I have learned a lot about residential contractors. Good course. Challenging, however some of the answers provided were incorrect and/or not in the book. Some questions are not in the book. I would think the terms in question should be addressed somewhere. Good Course! Being able to go back a review and retake quiz is a plus. Seemed to be good we'll see when I pass. Very good online course ! I like how everything repeats itself. Its like u go over everything twice, so, 4 me it makes it easier to retain the information. Overall great info, would like more interactive study sections, maybe even pop out video course options. PERFECT balance of information and quiz. Thank you! There were many material references in the quizzes that were specific to only the online material. So it helps tremendously to have both online as well as having the book available for studying this material. Easy to follow course, I feel it was informative. Book arrived fairly quickly too. the information was very relevant and made for critical thinking of RMI understandings. This was a very beneficial course that has prepared me well for the test. This course is awesome . Love the layout and formation of course to progress forward . Money well spent continuing education will be performed through atyourpaceonline . The course is thorough. The only thing I'd like is to have the page # for the corrected answers. This was very detailed and actually difficult course to finish. But I am sure that it has prepared me for the big test! I felt that the course was helpful in understanding most elements of starting a business. Very Helpful. I'm sure it will help with the state test. Great course! As a former contractor in another state I learned some new things. Thank you! Pretty comprehensive and very helpful. However some questions do not align very well with information provided in the Contractors Guide that I used. I appreciated the logic of how the course and software worked. I feel as if this course is really well layed out and makes understanding easy. Thank you! Excellent Course! Thank you for all the valuable information. The course was overall very good. There we a few questions on the test that were purposefully misleading and the answers were not correct. Also I couldn't enter my full drivers license number in Study Time Sheet Info section. Great job I like that you can get on anytime you want 24/7. It works well when people work long hours. Excellent course,very detailed and easy to navigate. Great course, only problem kicked out several times when taking test. Hard to get back on test. Great Class! Very informative and easy to use. This course was very helpful. This is a very well constructed course, it challenges you and explains technical subject manner in understandable terms. Well done! Very fun course, I was enthused to take it, and highlighted a lot of useful information in the book. Thank you! Very good course. Thank you! There was one questions that was worded very complicated and a couple that made absolutely no sense to me but if these are the kind of questions that are in the State test then I can understand why they are in this test. The info provided within the course was very helpful. Course was set up fluently and efficiently to cover all the topics necessary for the test. Very informative course, Thank you. This course was very user friendly and easy to navigate on my spare time . I really enjoyed how easy to see the mobile version was on my phone. Overall very good course. I thought the course was very well thought out and concise. Overall this course was great. The only thing I would have liked was for there to be an audio aspect of the course. The site is fairly well written up though there were a couple of grammatical errors and things not written in particularly clear language. Very good and comprehensive - I read the book before I finished the online course though, so it was a little annoying having to wait to click through some of the sections. As far as the course goes it is very easy and understanding. My problem on the test wasn't really getting the answer, but understanding how the question was asked. I feel that is tricky and not necessary. Other than that thank you for the ability to learn and challenge myself. Great course!! Some questions wording was confusing but after reading the questions multiple times they made more sense. Not all the info the tests wanted are in the book. some of the questions have overlapping answers and some really don't exactly pertain to contracting. The booklet did not have all the same information as the online course and some of the answers were not in the booklet for the final exam. Some information is outdated... ie minimum wage on the chapter quiz. And some questions are subjective like balancing petty cash (monthly), really? I would say weekly, but there is no rule on that. Silly question anyway. Generally satisfied. The course could be more dynamic, maybe some interaction or more pictures but the material is dry and that can't be helped. I found all the extra info in the Accounting and Tax section frustrating. Thanks! Doesn't entirely match the book. Some quiz questions were ONLY in this course, but not in the book. So I couldn't look back to find/review the answer/info. I like the accessibility of the course. The way it is organized helps you to study and get familiar with the material. This is a good way to work through the material at a relatively good clip. I'd recommend it as an option to get your CL. would be nice to have a reference to key words, so you could have easy access to the area you need to review. It appears the online course and the book does use the same wording or explaination of concepts. Review of quiz should have page numbers to find answer in NASCLA Book. Clear and straightforward...could utilize more visual images or models to reinforce the lessons. Most of the questions I missed had the wrong answers or were worded incorrectly. Some test questions need updated as they do not match information found in the book. In all this course was very thorough. However, I found two questions on the pre-final exam that were incorrect on your part. Other than that I rather enjoyed this course. Over all the course was helpful, thus far. However, I have not taken the CCB test yet. The course has several questions that do not make since, or are misleading. This is not helpful, unless that is directly from the CCB test. wording and definitions a bit off what test questions are and makes it difficult for answering. Over all very educational and was a bit more than the 16 hrs to finish. This course provided sufficient information in an easy to read manner. It adequately prepared me to pass the CCB exam and offered the flexibility to access the class whenever and wherever I pleased. Pretty good course. Only reason i didn't give 5 stars is some of the answers to the questions are not in the book. Great at your own pace course though. overall fairly good course.I wish there was a glossary of terms in the back of the book, with reference to where to locate the info in the chapter. also, there was one wrongly worded question on my second exam, it had something to do with the amount of bond a commercial contractor had to have per incident... it should have read how much insurance, not bond. I also wish there was a wider selection of questions on the final exam. meaning, I took the first test when I was half asleep, and failed. Was quite good but were a few areas that were difficult like continuing education requirements. I liked this updated book better than the last; it's shorter and easier to read. However, there's a lot of repeat information or parts of topics covered in different places so with it not having an index or glossary, you really need to know where to locate things, and furthermore, there could be a few places to look which makes it complicated to verify answers in terms of testing. Good overall, but I did find several questions that the book simply did not define, or have a quantifiable answer to. i thought some of the wording was incorrect in the test ie.insurance and bonding questions. Very informative. A lot of information to cover in 16 hours. I thought the course was very helpful and definitely got me ready for the final test. The one minor complaint I have is I noticed that after reading the chapter in the NASCLA Guide and then going through the corresponding chapters online sometimes their was information online that wasn't in the book. It worries me a little bit because I know the final test is an open book test, but it seems their's a possibility that some of the questions I have to answer might not be in this book. Would be nice when taking the tests and reviewing to have the correct answer of the question with the chapter it is related to. I would have liked more thorough reviews/quizzes after chapters. Also some of the test questions are vague and confusing. I think the NASCLA contractors guide is well written and provides easy to access important information. You need to up date you course to the 2nd Edition of the book! HARD TO REVIEW BEFORE I TEST. Some test questions are worded very poorly, making hard to understand what is being asked. How the course is worded and laid out is good and easy to understand. But it doesn't seem to be a complete course, many of the questions in the quiz's are not covered in the course content at all, like the number of hours of continuing education that is required. Also the paper CCB guide that is mailed, doesn't include a LOT of the material that the online course does, having this manual for the open book test is basically useless because of how much information is missing in it. I feel the paper book needs a update. im a flooring sub contractor .The course material does not pertain to my craft or daily business dealings. I think the question of what type of license will a person carry should be asked so they can get specific training on that particular license. No response to email requests about expedited shipping of textbook. Had to borrow from a fellow contractor to finish course in shorter amount of time. While any extra info is always appriciated. It would have been nice to know what extra info you used was identified as "Not in the manual". I could have written that info on another paper instead of sibling it down in the margins of the manual. If it was identified it would have been a lot easier to take your pre test. I spent time searching the manual during the test for info that was not in it. thus the 3 star rating. Was not a fan of having to buy 2 books. Some of your exam questions don't match the books terminology which leaves the questions open for interpretation. I was not able to find the specifics to question answers in the NASCLA book but remember reading them in the online review. Also there are a lot of spelling errors.